The oeuvre of milliner extraordinaire Stephen Jones contains hats both wearable and conceptual. 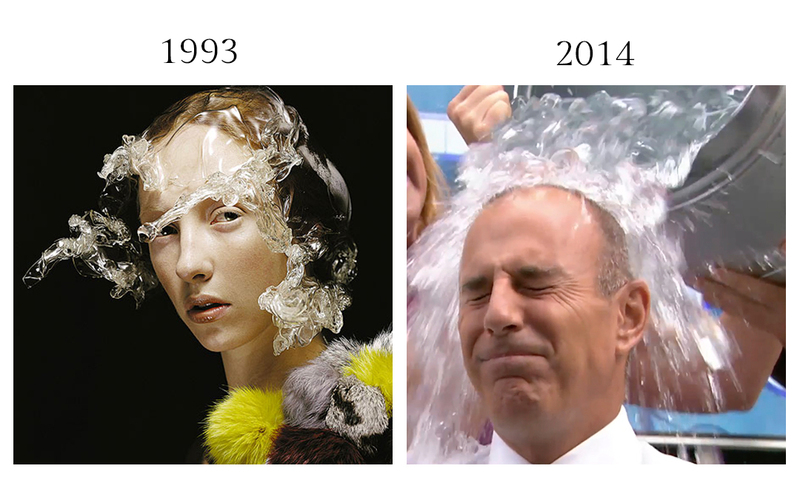 His 1993 acrylic headpiece, cleverly titled “wash ‘n’ go,” simulates the look of splashed water atop the wearer’s head. Charity, not fashion, is the reason many celebrities are partaking in the wash n’ go look this summer as part of the ALS Ice Bucket Challenge. While nominations for the 24-hour challenge have been bouncing around since last winter, the craze first received national attention when golfer Greg Norman challenged Matt Lauer, who was subsequently doused with a bucket of ice water live on the Today Show.